Q: Larry Kudlow, the US National Economic Council Director, said yesterday that China is to blame for failing to reach an agreement with the US to avert trade tensions. Do you agree with what he said? A: I have seen relevant reports. 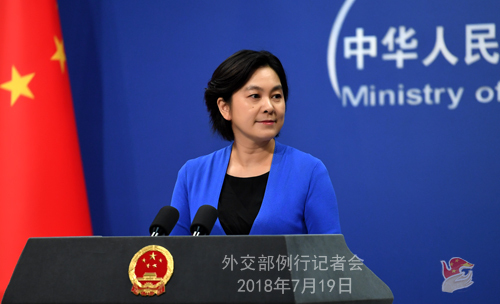 The statement by China's Commerce Ministry on July 12th depicts a whole picture of how China and the US had engaged in consultations on the trade issue. 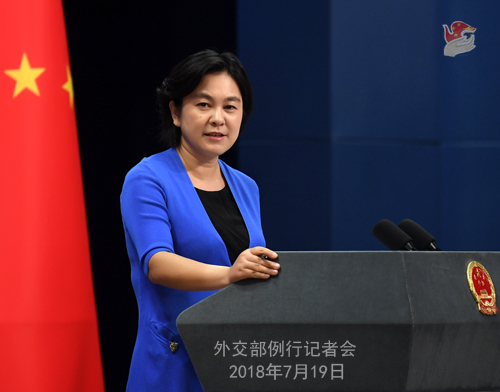 It is clear that China has been sincere and patient enough to seek a settlement of the disputes through dialogues and consultations, and we have done our utmost to avoid an escalation of the trade frictions. Because of the media's close-up tracking, how this issue occurred and evolved has been laid bare for all interested to see. But right in front of everyone's eyes, the US went back and forth and ate its own words, and the US official still dared to call white black and tried to shift the blame onto China. That honestly entails some extraordinary imagination and is just preposterously shocking. Right is right, and wrong is wrong. What the US did once again chips away at its own credibility and will not help solve the issue in any way. China's position and attitude on the trade issue with the US is consistent and clear. From the very beginning, we made clear our firm position of not wanting to fight but never afraid of fighting. The US, however, holding high its baton, has been rudely threatening and coercing China, and brazenly engaging in flip-flopping and backpedaling, which is the direct and root cause for the escalation of the situation. The US should keep in mind that today is the 21st century with a high level of economic globalization, and it is China they are dealing with. Those in the US should drag themselves out of their quixotic fantasy and stop acting as if they were the Don Quixote of the 17th century. I would like to stress again that our position on the relevant issue remains consistent, and our attitude is firm and clear. We have all the confidence, assurance, conditions and capabilities we need to ensure our legitimate and lawful rights and to uphold international rules and the multilateral trading system along with other countries. Q: Will China have more investment cooperation with the Philippines? A: I would refer you to the competent department for the details. China-Philippines ties are developing with a sound and steady momentum. Practical cooperation in various fields has made headways. Several days ago, President Duterte thanked China for helping the Philippines build bridges and achieve economic and social development. We support President Duterte in leading his people towards greater economic and national development. We stand ready to work with the Philippine side to continue to move forward our mutually beneficial and practical cooperation in various fields in accordance with the consensus reached by our two leaders. Q: The US Assistant Secretary of State for International Security and Nonproliferation Christopher Ford said in public recently that China purposefully evades US export control policy to attain advanced US technologies legally or illegally through such means as civil nuclear cooperation, and use them for military purposes via "military-civil fusion" in service of major-country competition. What is your comment? First, China is firmly opposed to the proliferation of weapons of mass destruction (WMD) and their means of delivery. We have been strictly fulfilling the international non-proliferation obligations and relevant international commitments, comprehensively and completely implementing relevant Security Council resolutions and actively participating in the international non-proliferation process. Over the years, with a great sense of responsibility, China has gradually set up a well-established non-proliferation and export control system. In terms of both internal management and export control, the Chinese government has taken stringent control measures to ensure effective implementation of relevant laws and regulations, making positive endeavors for and important contributions to maintaining international and regional peace and security and upholding the international non-proliferation regime. China always maintains that on the one hand, it is imperative to prevent all countries from engaging in proliferation activities under the pretext of peaceful use; on the other hand, on the condition that the non-proliferation objective is secured, the legitimate rights of all countries to utilize dual-use goods and technology for peaceful purposes should be guaranteed. Second, promoting civilian-military integration (CMI) is a widely accepted practice of the international community, the US included. China's CMI strategy is aimed to effectively integrate military and social resources and promote the integrated development of national defense and social and economic sectors. There is no such a thing as employing the CMI to "steal" or "transfer" foreign technologies. Over the years, China and the US have conducted civil nuclear cooperation on the basis of mutual benefit and win-win results, which serves the interests of the industries and the national interests of both countries. The cooperation strictly complies with relevant international obligations and the relevant agreements between the two sides. I have to point out that China's vigorous efforts and important contributions in the field of non-proliferation and export control are there for all to see. Such fabrication in disregard of facts by the US will by no means help the two sides to conduct and promote the non-proliferation and export control cooperation and other normal cooperation in economy, trade and science and technology, thus running contrary to our shared interests. We hope the US side will abandon the cold-war mentality, put the relevant issue in perspective and do more to enhance mutual trust and cooperation, rather than keep on making groundless accusations and speculations. Q: We noted State Councilor and Foreign Minister Wang Yi attended the reception in celebration of the 60th anniversary of the establishment of diplomatic relations between China and Cambodia yesterday. Does the Chinese side have any consideration for the attendance by Foreign Minister Wang Yi at this event? A: This year marks the 60th anniversary of the establishment of diplomatic relations between China and Cambodia. President Xi Jinping and King Norodom Sihamoni exchanged messages of congratulations with each other. Premier Li Keqiang exchanged messages of congratulations with Prime Minister Hun Sen. In his congratulatory message, President Xi said he hoped the two sides will continue to work together to build on the traditional friendship, deepen mutually beneficial cooperation, jointly forge a strategically significant China-Cambodia community with shared future and achieve common development and prosperity. Last night, State Councilor and Foreign Minister Wang Yi attended the reception in celebration of the 60th anniversary of the establishment of our diplomatic relations jointly held by Chinese People's Association for Friendship with Foreign Countries and the Cambodian Embassy in China, which is indeed a special arrangement as an embodiment of China-Cambodia friendship. State Councilor Wang Yi made an impromptus address at the reception. He said that, the number of 60 symbolizes completeness, happiness and a new beginning for both China and Cambodia. He recalled with deep emotion the profound friendship cultivated by the elder generations of leaders of both countries and the history of friendly exchanges. He also pointed out that entering the new century, the government of the Kingdom of Cambodia under Prime Minister Hun Sen's leadership has carried on the traditional friendship, firmly followed friendly policy towards China and unreservedly stood with China on issues concerning China's core interests and major concerns. Though small in size, Cambodia has demonstrated its iron will in defiance of power politics and pressure. State Councilor Wang Yi pointed out that friendship is reciprocal. Friends should lend mutual support and assistance to each other. As cherished by traditional Chinese culture, "a drop of water in need, shall be returned with a spring in deed". China has all along staunchly stood with the Cambodian people to support them in safeguarding their own sovereignty and legitimate rights and interests, and helped Cambodia to develop with its utmost capacity. In celebrating the 60th anniversary of the establishment of diplomatic relations between China and Cambodia, we aim to build on China-Cambodia traditional friendship and carry it on from generation to generation. We will stick to the general course of China-Cambodia friendship and use the 60th anniversary to plan for our bilateral relations in the next 60 years. We believe as long as we work together, the China-Cambodia friendship will remain evergreen and vibrant. Q: Taiwan's Mainland Affairs Council Minister Chen Ming-tong appealed at a symposium in Washington that Taiwan and the mainland have practical communications and dialogue to seek internal agreement. Official from the US Department of Defense said that Taiwan is an important partner for the US' Indo-Pacific strategy. What is your response? A: I would refer you to the Taiwan Affairs Office of the State Council for comments on Chen's remarks regarding cross-Straits relations. We urge the US to abide by the one-China principle and the three China-US joint communiques, and prudently handle the Taiwan issue. Q: Some US airlines, including the United Airlines, the Delta Airlines and the American Airlines have not yet complied with the Chinese government's directive to refer to Taiwan as Chinese Taiwan by July 25th. Are the US and China in talks to resolve this issue? What punitive actions will China take if they do not comply? 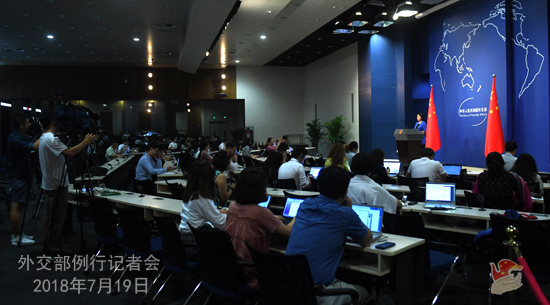 A: China's Civil Aviation Administration held a press briefing on July 13 on the latest development of the relevant issue. China's position is quite clear. Foreign enterprises operating in China shall respect China's sovereignty and territorial integrity and abide by Chinese laws and regulations. The same can be said for Chinese enterprises operating in other countries. Moreover, one China is a basic fact and international consensus. Q: Who from China is going to the G20 Finance Ministers' Meeting in Argentina? What does China have on its agenda for the meeting? A: I have no information on that. I would refer you to the competent departments.